I know, I'm about a week late, worse than during my Italy trip last year. But, we'll rip through these rather quick. 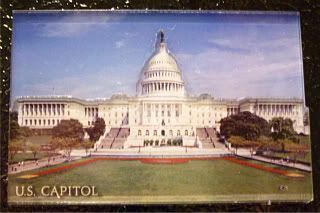 In between checking job boards on an otherwise quiet Christmas week in DC, I ended up signing up for the Capitol Tour. The giant auditorium (which I'm sure is full up during peak season) was nicely done, and of course, I liked the movie about Democracy and Our Nation's Capitol. I totally felt like I was back in Mrs. Bradley's 7th grade civics class, one of my faves. The tour, however, really was not. It wasn't the tour guide's fault, not really. His job was just to shepherd us from room to room and give us some factual information for us tourists to take away. The trouble was, the point of the tour became, walk through the superhistoric room and get out. No milling about. Any questions? No. Good. Onward. Ya'll know I love my drive-by tours, but dang, that's in a car! When you get literally a 5-second walk through the superhistoric rooms - NO, WE DON'T HAVE TIME TO FORM ANY QUESTIONS FOR YOU, SO DON'T LOOK SO DISAPPOINTED IN US! I did feel bad, the tour guide wanted us to have a real tour, but it was just too quick. He tried, though. In places where we could linger, he told us about the Capitol Rotunda paintings, and the stories behind each of them. Very, very impressive, though my only takeaway was that Pocahontas was Baptized a Christian, and took the name Rebecca. And, we saw the original placement of John Q. Adams' and Millard Fillmore's desks. And tons of statues - all the states were allowed to send two statues to reside at the Capitol...but they could do a whole separate tour for just the statues. And where the Amistad case was tried (though, I think I fairly ran through that room). All in all, hurried (harried? Both.) tour aside, I was more blown away by standing in the place where so much of our history has taken place. A truly cool experience. And one highly recommended. Take the tour. Like half the things in this lucky, lucky city, it's free. And people died so we'd be able to walk through those rooms really quickly. awww... still makes me sad that gordon and i couldn't go with you! we would've been able to give you a REAL tour!!! there's SOOOO much more to see and hear about in the capitol! I didn't like my tour either. My tour guide was brisk and brusque to the point of rude and pushy. Grrr. Yeah, see? They're under pressure to get people in and out and around about. It's annoying.